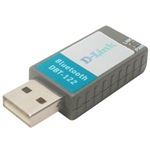 The D-Link Personal Air DBT-122 USB Bluetooth Adapter is a very compact, low-profile solution based on the Bluetooth 1.2 specification, making it compatible with other Bluetooth enabled devices. Please note the REVISION of your product to select the correct download. Your product revision is indicated on the sticker at the bottom of the unit.